This past weekend IES took us on a trip to Portugal. To be completely honest, as far as weather is concerned, the last two or three weeks in Salamanca have been… less than ideal. That’s to say, every single day for a pretty much constant 18-21 days, we have enjoyed a frigid cold rain. I can’t really complain, right? I mean a couple days of rain and temperature hovering around the 40’s is really nothing compared to what my compadres in Michigan are currently dealing with (sorry, Holland folks). Besides, I’m in Spain! Needless to say, a weekend bus ride out of the rain to coastal Portugal seemed to all 30 of us as a welcomed relief. 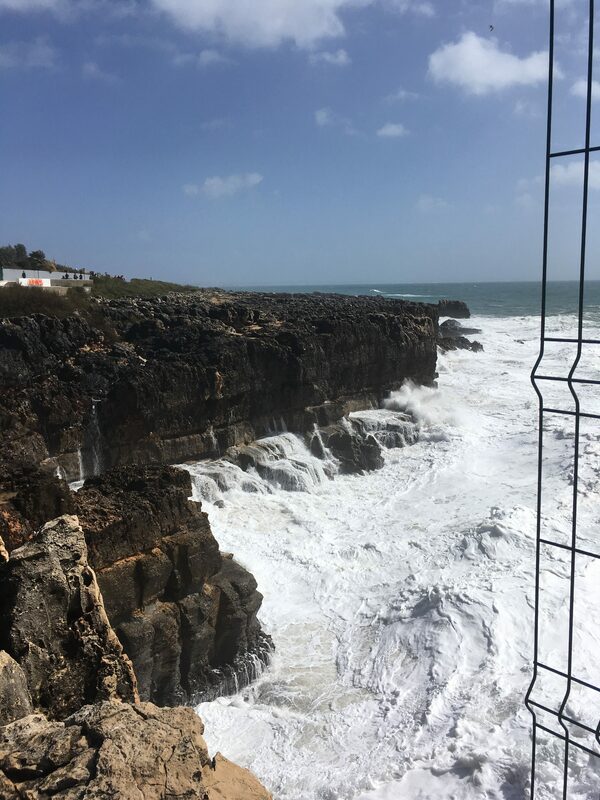 Just at that perfect moment, you know, when you’re really excited about something, we all got an email: Severe thunder and rain storms moving through Portugal, Spain. Look out for floods. Rain all weekend. “Sweet”, we thought. At least we would be getting drenched by Portuguese rain, which, as I’ve heard, is a better, less wet, kind of rain. 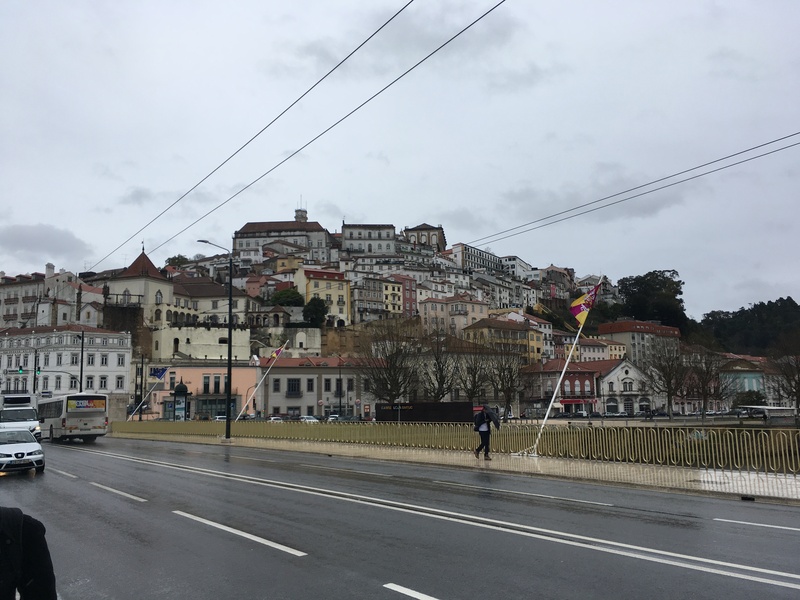 The bus ride was about 7 hours to Lisbon, but we made a stop about half way – in rainy Coimbra, Salamanca’s sister city in Portugal. We had to do our planned guided tour from inside the bus (on account of the rain); we didn’t mind. We had a few hours of free time where most of us decided to split up and head to the cafes. 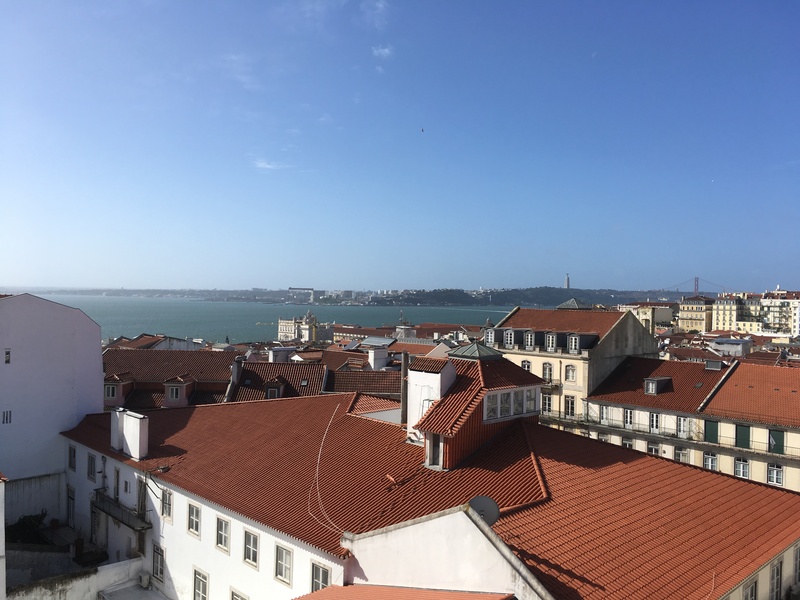 I sat down, excited to try pasteis de nata (a typical and delicious Portuguese dessert), and instinctually ordered myself a coffee, “¿Qué tal, tío, me pones un café americano solo, y un…. ?” Then it hit me. I had just ordered my coffee in Spanish – only catching myself by not knowing how to say “pasteis de nata” in Spanish. The waiter looked at me in my sincere state of confusion. I stared at him for 10 seconds in silence as my brain decided whether or not we spoke Portuguese. Deciding we didn’t, “you, uh… you speak English?”, I said. It was not when we crossed the border, not when I stepped off the bus in Portugal, and not when I walked around Coimbra, that I realized I had finally left Spain. You see, I hadn’t even realized that for two months I had not left the country. Spain had been my only home for these eight or nine weeks and it had conditioned me to speak Spanish at all times in public places. Well, lucky for us, the Portuguese have an excellent and obligatory English education in their primary schools. They all speak English pretty well. With my first Portuguese “cultural collision” out of the way, we headed to Portugal’s capital city. The first thing you’ll notice about the magnificent Lisbon is that it is oddly similar to San Francisco. 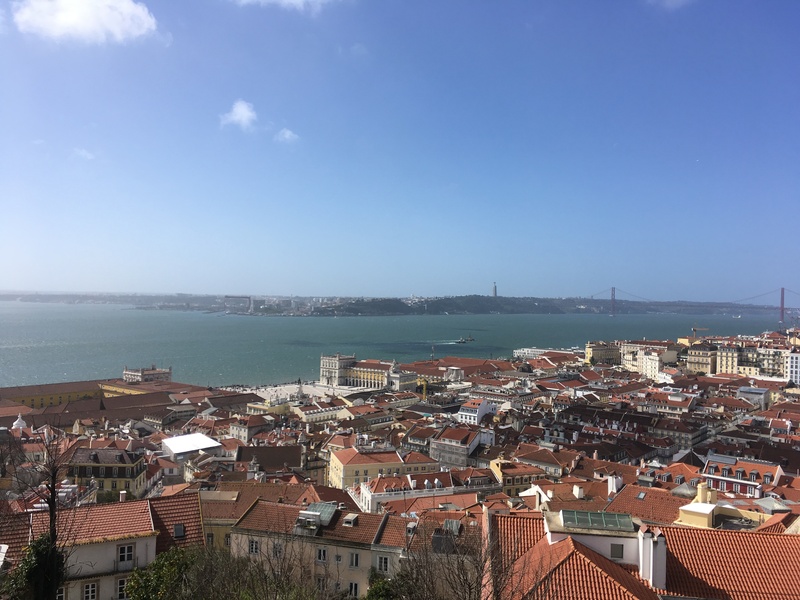 From the dark-red suspension bridge, to the constant climbing and descending of hills, to the windy weather, Lisbon was an entirely captivating place. Although our first night in Lisbon was spent in a hotel listening to rain, (parts of) our next two days were unexpectedly lovely. 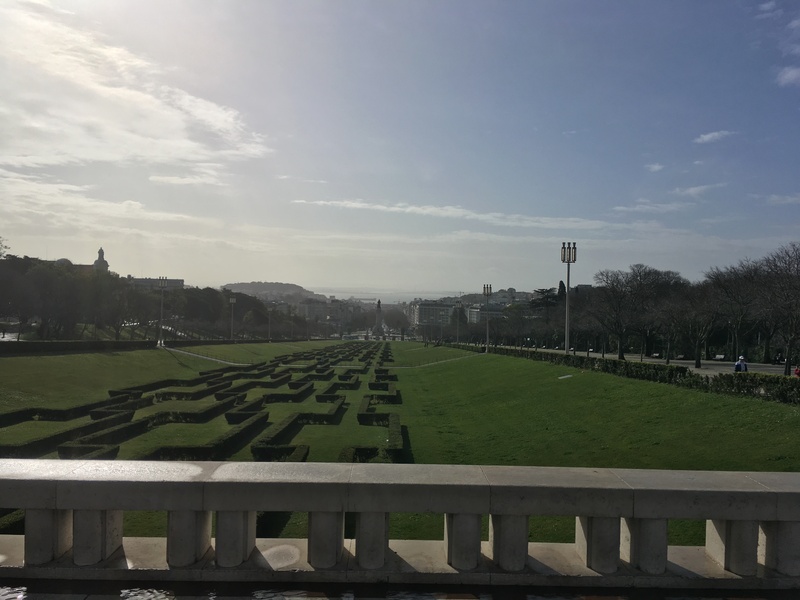 Blue skies, t-shirt weather, and the sunny bay of Lisbon – it was truly a gorgeous experience. 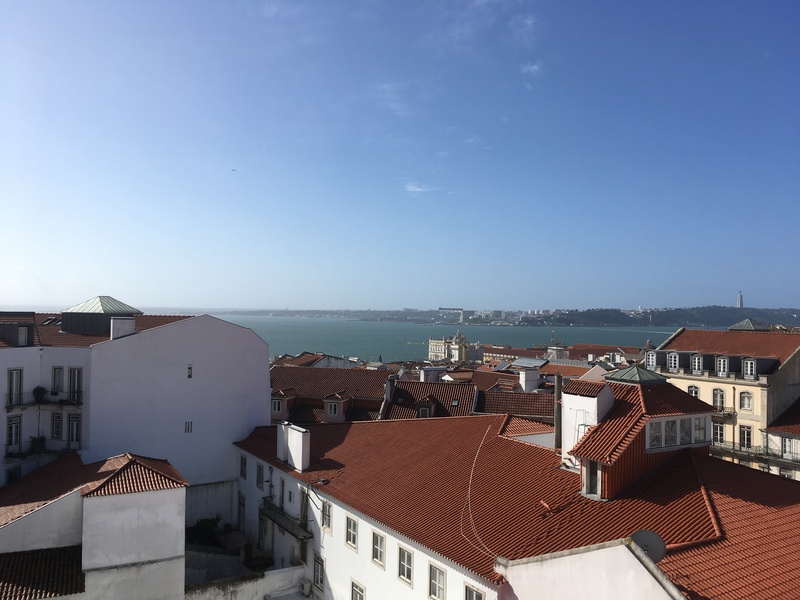 We got a great view of the city from the tallest point (a castle), we watched a Fado show (Portugal’s “flamenco”), we dined Portugal style (you must try the Bacalao), we saw incredible coastal cliffs, we enjoyed the marvel of Portugal’s monuments, churches, and basilicas; we did it all. Without spoiling too much of the experience for others who may venture to go, I will simply say that I adore this city and its charm, and only wish that I had more than two days to explore it and enjoy. I will, without a doubt, be coming back to Lisbon. And IF you do come, among the countless pleasures that exist here, I cannot overstate my love of the food. For, as the traditional Portuguese song reminds us, cheira bem, cheira a Lisboa (It smells good, it smells like Lisbon). Coimbra. We stopped here for a rainy bus-tour of the city’s quaint university. We got a dinner and a show our first night in Portugal! 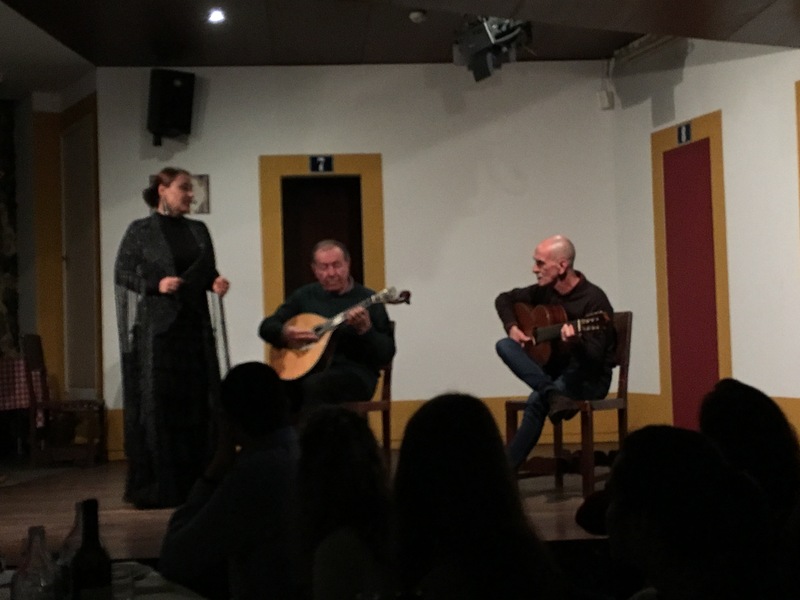 Here, the performers blew the crowd away with a traditional style of Portuguese singing called “fado”. It was breathtaking. 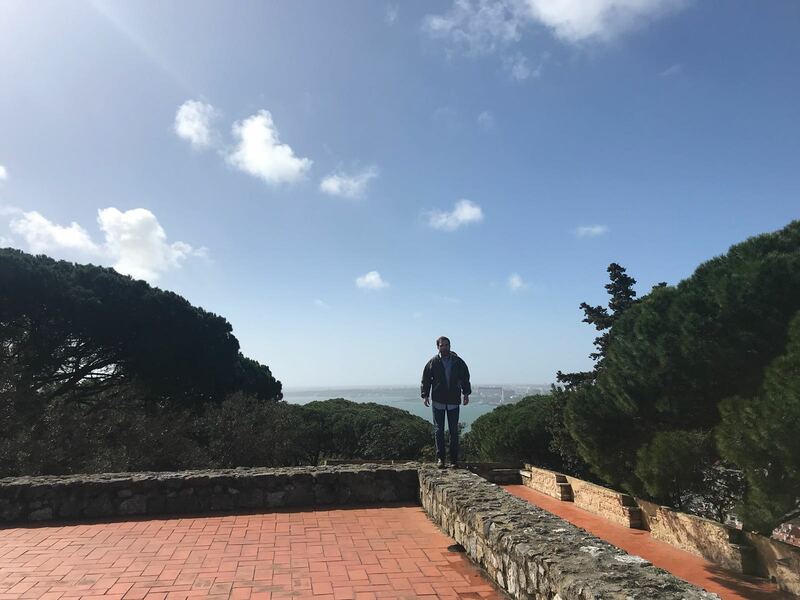 Candid photo of yours truly having an episodic experience on top of this ancient fortress. I think in this photo I was listening to the “Pirates of the Caribbean” soundtrack and pretending I was a pirate. Don’t knock it until you try it. These cliffs on Lisbon’s coast were one of the coolest things I have ever seen. The name does not overstate itself, “Boca del Infierno” (Mouth of Hell). Here, the waves crashed with such immense force that salty spray would hit you from hundreds of yards away. Here’s another view of Lisbon from on top of the castle. Check out the bridge in the background. It was built by a California bridge company AFTER the Golden Gate after Portugal had experienced some devastating earthquakes. The suspension bridge appealed to them as much for safety as for style. This castle was positioned for defending the port (pictured above), and still has cannons to this day watching over the main plaza (the square part touching the bay without buildings). 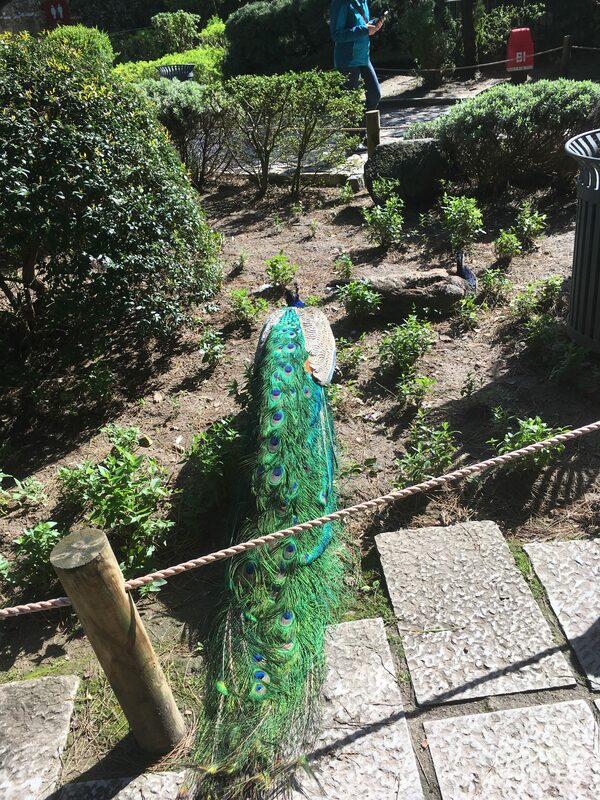 In Lisbon, the peacocks are as abundant as the fresh air. 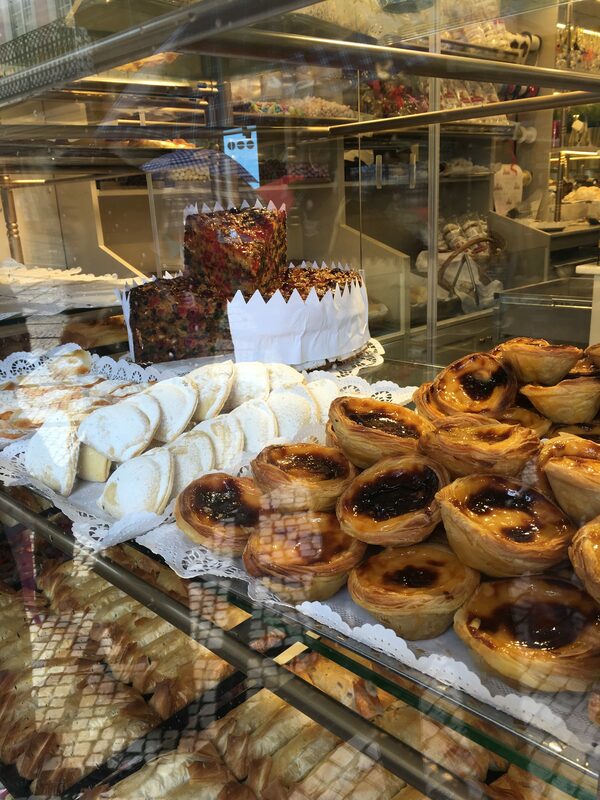 Pasteis de nata (right). I would describe them as: flaky outside, custard inside. Worth the trip alone. Again, Lisbon. Here the city is pictured during one of our brief hours with sun. Hell’s Mouth. 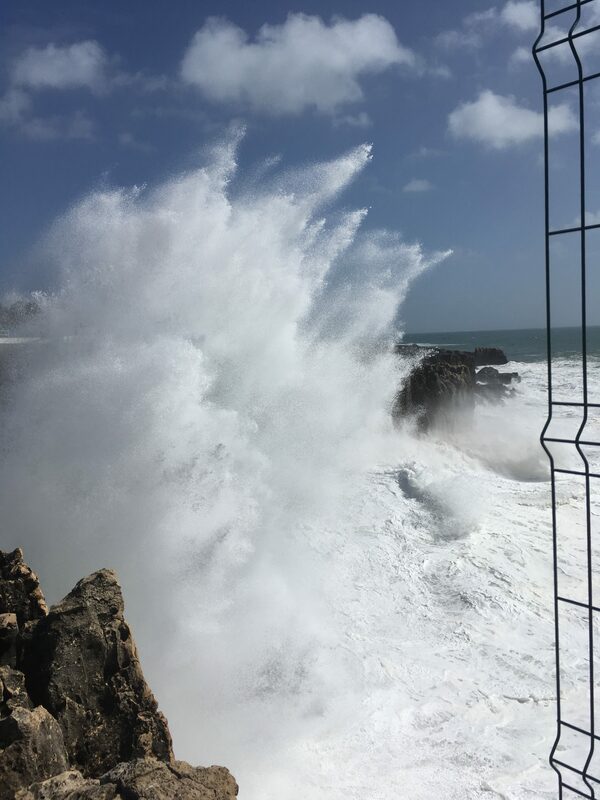 The raw power was mesmerizing; I sat entranced for an hour watching the crashing of the waves.